This is the 4CX1000 amplifier that I use on two meters. It will put out a maximum of 1400 Watts with 3000 Volts on the plate, and 300 Volts on the screen grid. It is a grounded grid design with a filament choke which makes a very stable amplifier. The down side is that it requires a little more drive power and driving the cathode is a little harder to match to. The HV power supply is mounted on the floor of the cabinet. I had two matching RCA 3000 Volt HV transformers, but they only had 120 Volt primaries. I wired the primaries in series for 220 Volt operation, and a full wave rectifier on each secondary, then paralleled the output of the rectifiers. This worked out well with no noticeable unbalance in the windings. The filament transformer is on the amplifier chassis, and the bias and screen supplies are on the LV power supply deck. 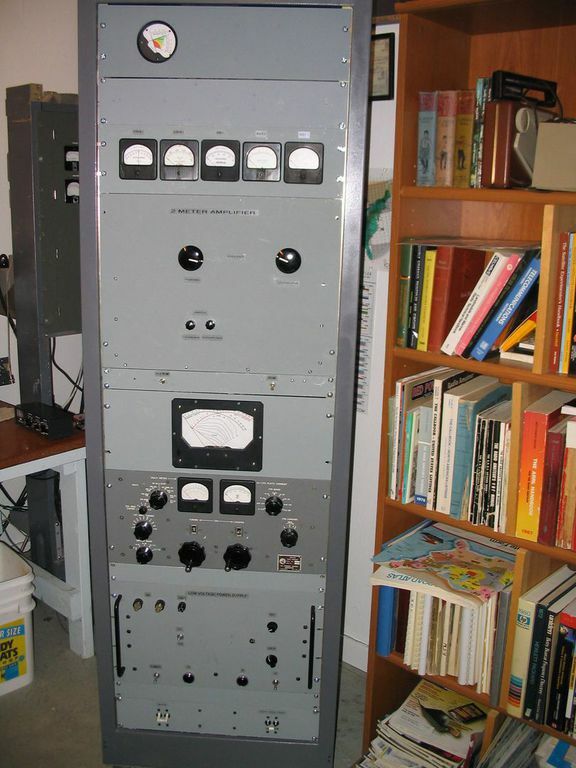 You may have noticed the TMC PAL-1K in the cabinet with the two meter amplifier. It is actually a RF1D 1 Kw driver drawer from a GPT-10K transmitter. They are essentially the same, except the front panel markings say driver, rather than PA. On the LV power supply panel there is a switch to switch the filament primary power between the two meter amp and the PAL-1K filament transformers. Although it is a project I have not got to yet, it is intended to use the same bias, screen and HV supplies for both amplifiers and switch the filament primary power between them. There are dual adjustable bias outputs and dual screen voltage outputs on the LV power supply deck for the two amplifiers. The relay panel has the amplifier bypass relays. The power/swr meter panel has dual 30 microamp crossed needle meter movements for forward and reflected power. It is connected to a Bird dual line section coupler with 2500 and 250 Watt slugs. The small panel with the two toggle switchs is the control chassis. It has the sequencer and control circuitry for T/R sequencing of the amp and tower top pre-amp.